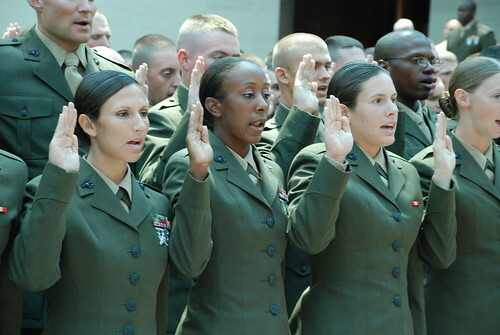 Yesterday, Charlie and Delta companies were commissioned as 1st Lieutenants in the United States Marine Corps. This one event, one ceremony, is life changing. 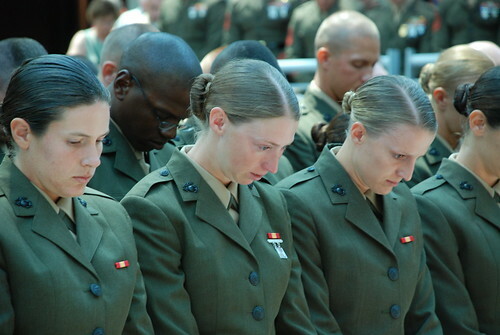 It marks an end to 10 weeks of training where they have been tested physically, mentally, intellectually, morally and emotionally and found to be capable of leading Marines. 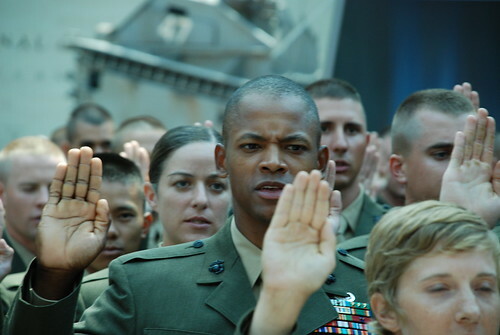 Some candidates who arrive at Quantico to complete the equivalent of "Boot Camp" for Marine Officers, do not make it through the rigors. Others, after making it through the training process, choose to not take a commission. 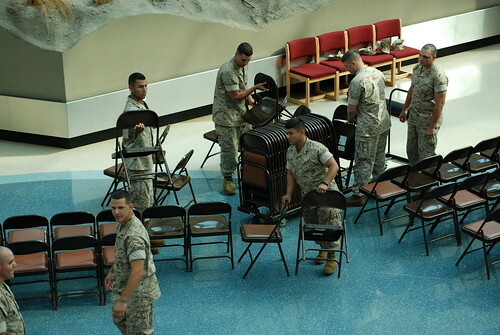 While the graduation ceremony was going on at OCS on mainside, Marines were setting up for the commissioning ceremony in Leatherneck Gallery of the National Museum of the Marine Corps. 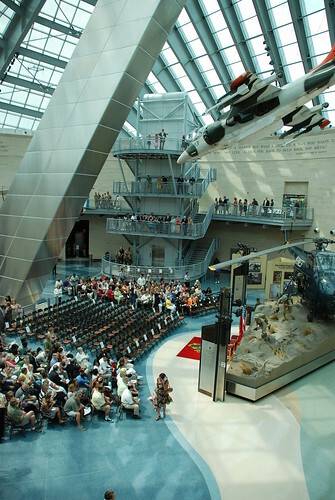 Not only did this include setting up chairs, but also setting up flags outside along the walkway up to the museum. 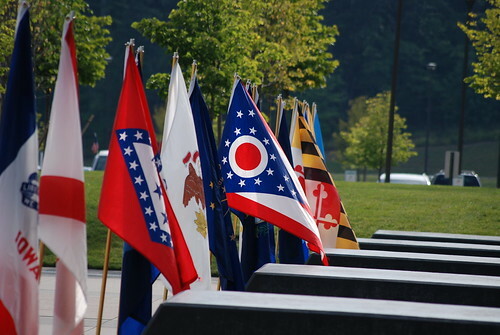 While it was a hot, stagnant morning, a nice little breeze popped the Ohio flag out for a picture. Yes, my home state is Ohio and to be honest, it is the only state flag that I can identify. Even though the ceremony did not begin until 1 p.m. (aka 1300), family and friends were staking out claims to seats an hour early. When I went down stairs and made a pit stop in the bathroom, I was met by a gaggle of women lined up at the mirror, primping themselves for their boyfriends, fiances and husbands they had not seen in 10 weeks. The air was heavy with the scents of about 20 different hairsprays and perfumes. 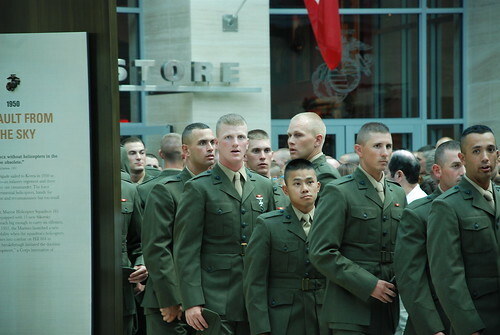 When the Marines of Charlie Company entered, they were greeted by boisterous cheers, whoops and hollers. 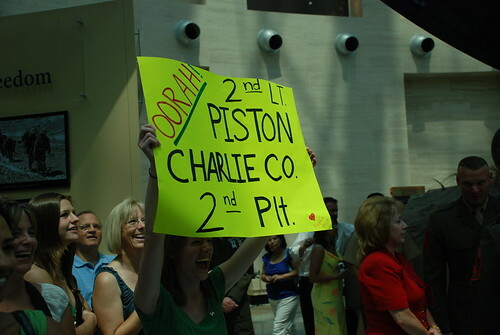 A very excited Marine Wife holds up her sign for her Marine. 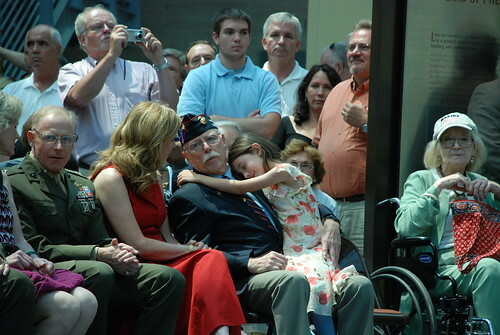 I really liked this photo, this little girl just ran over and snuggled up with her grandfather. 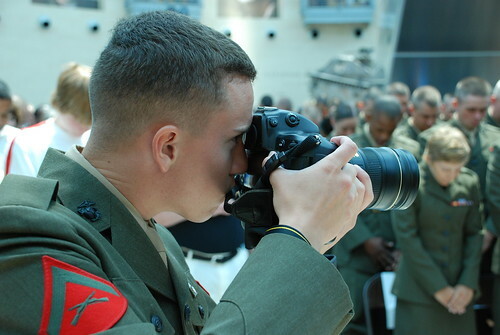 I could not resist photographing this Private First Class, the combat cameraman assigned to shoot the commissioning ceremony. The commissioning is about to begin. and that I will well and faithfully discharge the duties of the office on which I am about to enter. So help me God. 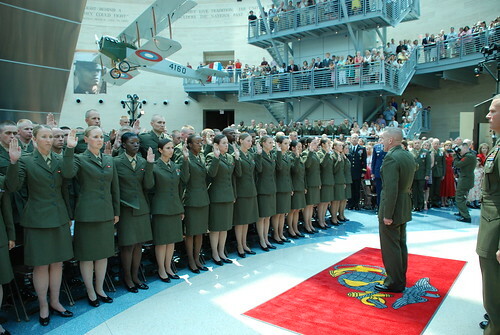 An Army and Air Force general applaud the company, but also their children who, on this day, became Officers of Marines. 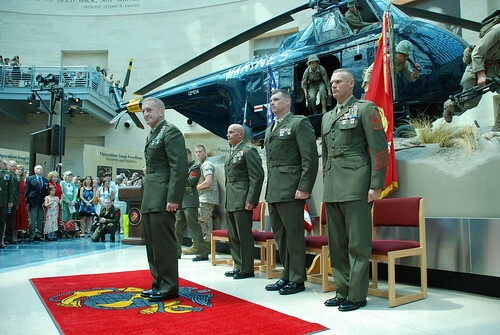 After they were commissioned, the Chaplain blessed the company. 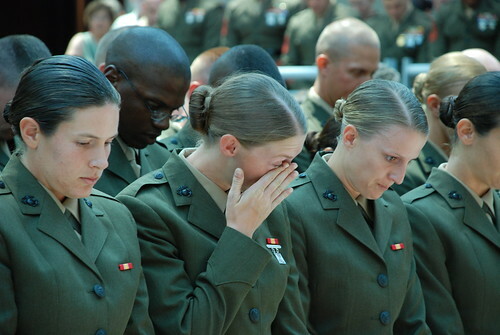 Emotions came to the surface for one Marine. Yay! We made it! Many hugs and handshakes followed. 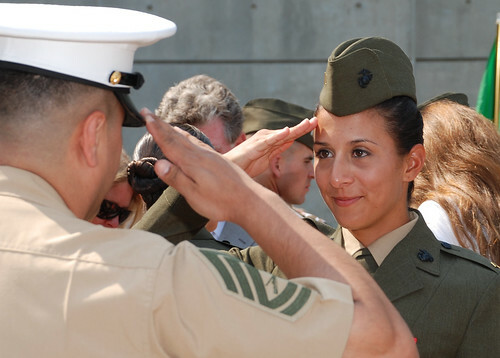 There were many more families this year who had family military service traditions. 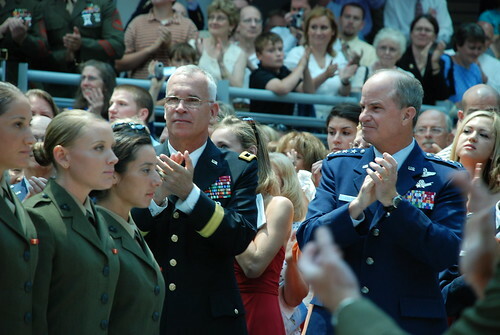 Here, a father salutes his son. 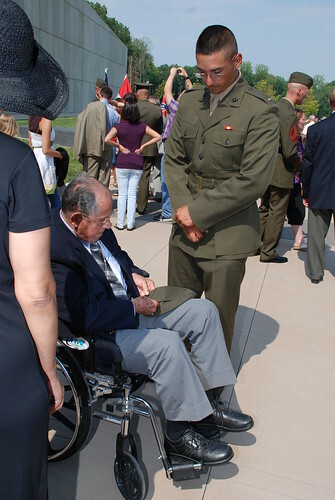 Below, the Lieutenant's father (Marine) and Grandfather (Air Force) help with pinning on his bars. 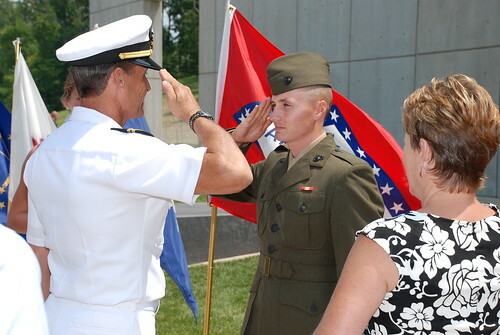 A younger brother delivers the first salute from an enlisted man to his brother, a newly minted officer. 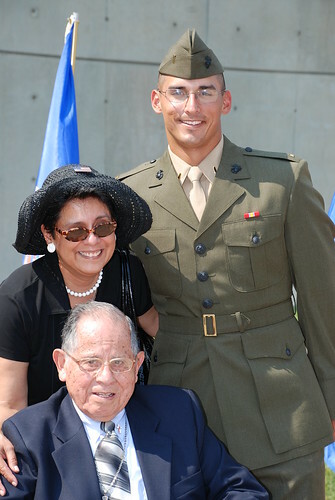 The final pin was saved for his grandfather, a World War 2 veteran of the Army Air Corps. 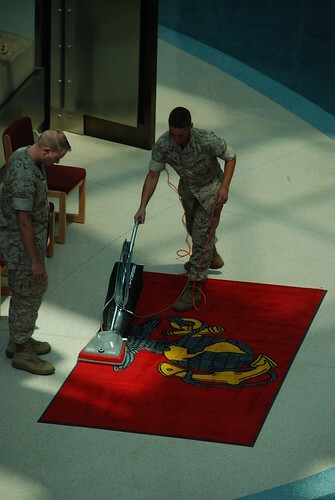 Ever mindful of details, Marines make the Eagle, Globe and Anchor carpet perfect for Delta Company's ceremony. 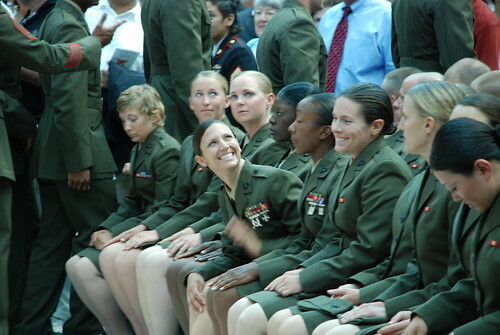 I couldn't help but wonder if the supervising Marine was tempted to say, "You missed a spot". 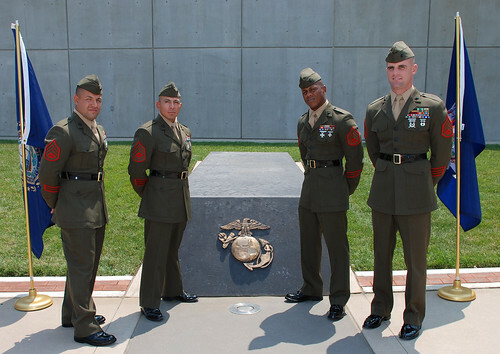 Some of the Drill Instructors who trained the new officers. I recommended that this family climb up on the pedestal for some pictures. I am surprised more people didn't do this. What a fun photo. Love the leg kick, ladies! 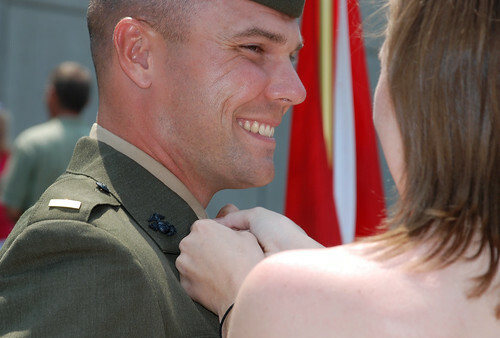 I just loved this smile this Marine gave his wife while she pinned on his Lieutenant bars. Same with this photo. 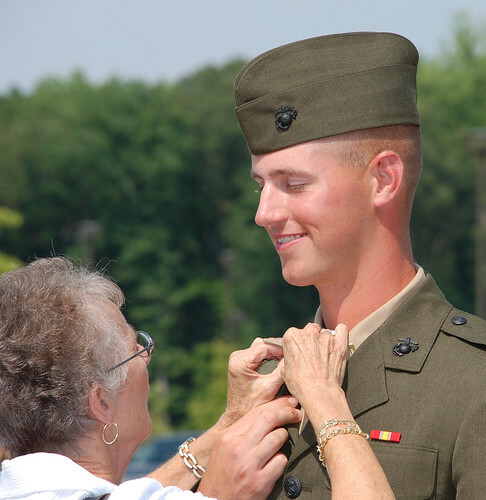 Love the Marine's look as his grandma pins on his bar. 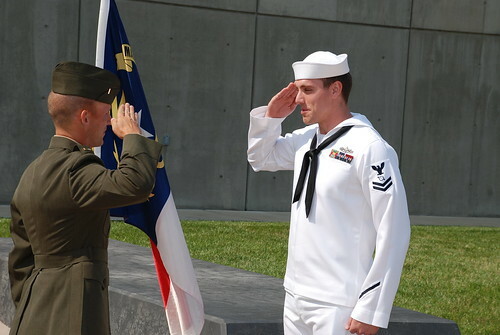 This was my favorite salute photo. Talk about good timing on my part. I saw it as I walked by and was just in the right place to get their hands crossing. 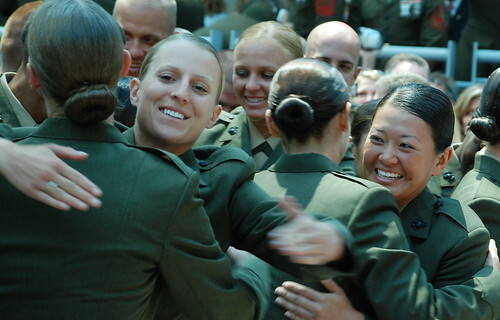 The pride in the faces of those newly minted 2nd LT's leaves the words stuck in my throat. Great post, really gives an overview of the ceremony. 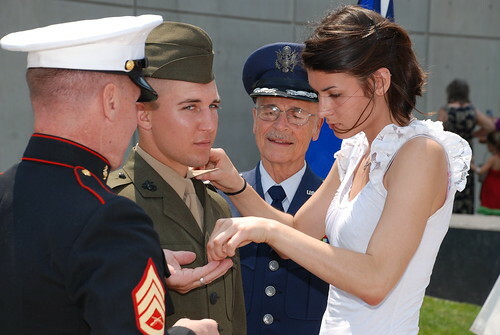 My husband will be going through Army OCS and this at least helps me get an understanding of the ceremony ahead. Thanks, and your pictures are gorgeous! 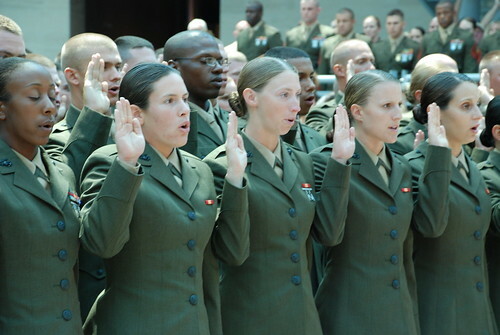 That "Very excited Marine wife" holding the sign is Our Daughter!!! It was a great day for us all.